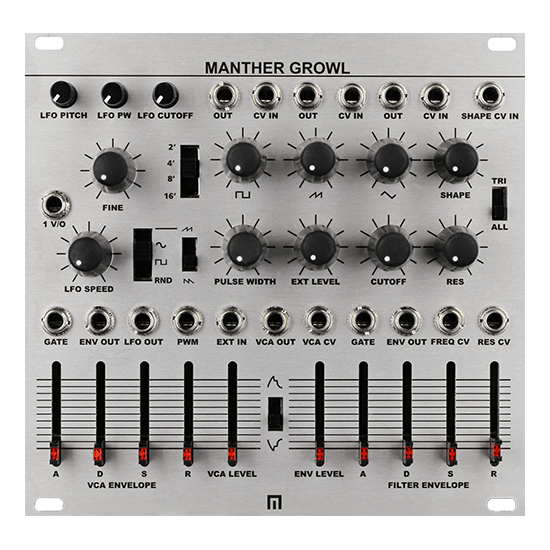 MANTHER GROWL is a full featured, Eurorack monophonic synth voice with an analog signal path, and like the Manther Tabletop, it includes a coveted CEM3340 VCO IC chip. The analog filter is based on an SSM2044 chip. Square, Saw and Triangle waveforms have their own individual level controls (manual control as well as CV jack inputs), as well as their own individual outputs. Wavefold control can be set to Tri or ALL (folds all waveforms and external input post-filter). Dial the independent LFO level controls to modulate pitch, pulsewidth and filter cutoff. Also includes manual controls over both VCA and filter ADSR and both the VCA and filter have individual gate inputs. MORE DETAILS BELOW! STAY TUNED FOR MORE PRE-ORDER INFO SOON! 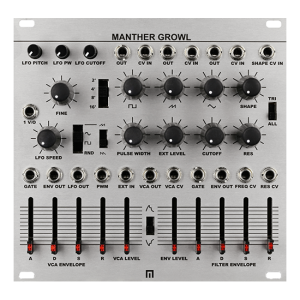 MANTHER GROWL is a full featured, Eurorack monophonic synth voice with an analog signal path, and like the Manther Tabletop, it includes a coveted CEM3340 VCO IC chip. The analog filter is based on an SSM2044 chip. Square, Saw and Triangle waveforms have their own individual level controls (manual control as well as CV jack inputs), as well as their own individual outputs. Wavefold control can be set to Tri or ALL (folds all waveforms and external input post-filter). Dial the independent LFO level controls to modulate pitch, pulsewidth and filter cutoff. Also includes manual controls over both VCA and filter ADSR and both the VCA and filter have individual gate inputs.